A quick and easy recipe for peanut butter muffins. Serve them with jelly, honey, or butter for a tasty breakfast or afternoon snack. Preheat oven to 400 degrees F. Lightly grease a 12-cup muffin pan. Whisk together egg, milk, peanut butter, and oil in a medium bowl. Stir in cereal and let sit for 5 minutes. Add cereal mixture to flour mixture and stir until dry ingredients are moistened (do not over-mix). Bake 18 to 20 minutes, or until lightly browned and a toothpick or cake tester inserted in the center of a muffin comes out clean. Remove muffins from the pan. Serve warm or at room temperature. 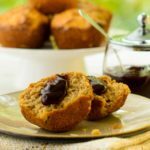 *You can use flavored peanut butter for different twists on these muffins.